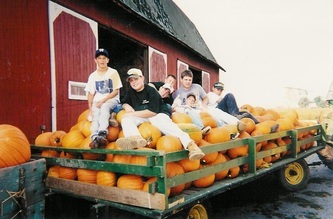 Gust Brother's Pumpkin Farm began selling pumpkins in 1989 with a 1/4 of an acre patch, which is slightly bigger in size than a large garden. The picture to the left was taken in 1992. 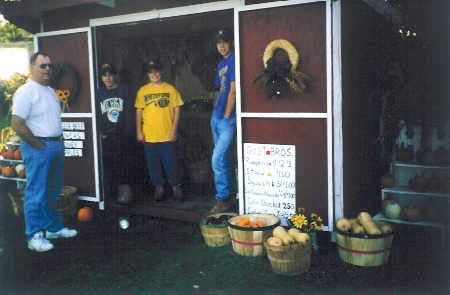 As you can see, the pumpkins were sold off of a wagon in the front yard by Dan Gust and his 4 sons. During the first years, Gust Brothers kept its product line simple, mainly growing only pumpkins, squash, and gourds. However, over time, Gust Brothers began selling a wider variety of items. Currently, they produce over 100 different varieties of crops, produce, and crafts. In 1995, Gust Brothers introduced a small market (above left) to the front yard. The project was constructed by the 4 Gust boys and their grandfather and helped to improve business in the front yard. School tours became a mainstay at Gust Brothers as well. 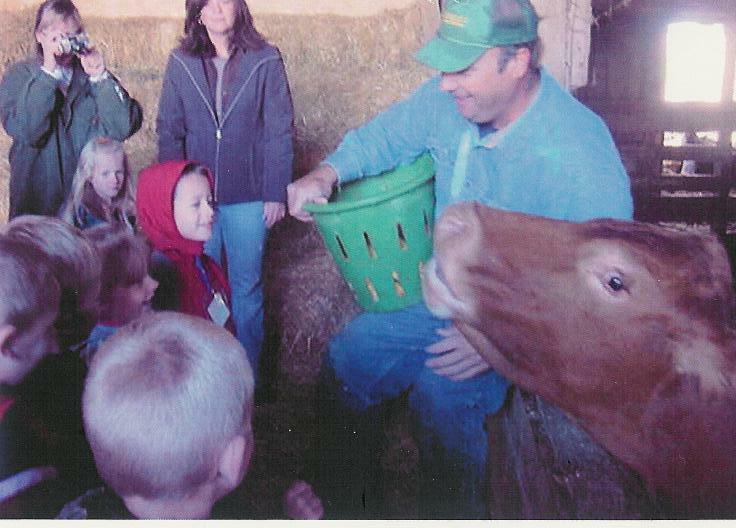 In the center picture, Mr. Gust, with the help of Red Cow, are giving some youngsters a lesson on animal nutrition. During this time, the farm raised approximately 4 acres of produce. The increased production meant larger wagons and a larger work crew to pick that produce (above right). For years, the farm continued to sell out of the sale barn in the front yard. In 2009, a change had to be made, and the small market was moved out of the front yard and into another location where it would be better utilized. The sale barn has now moved to a larger barn with a more centralized location. Gust Brothers appreciates your support throughout the years and will continue to make improvements to better serve you.